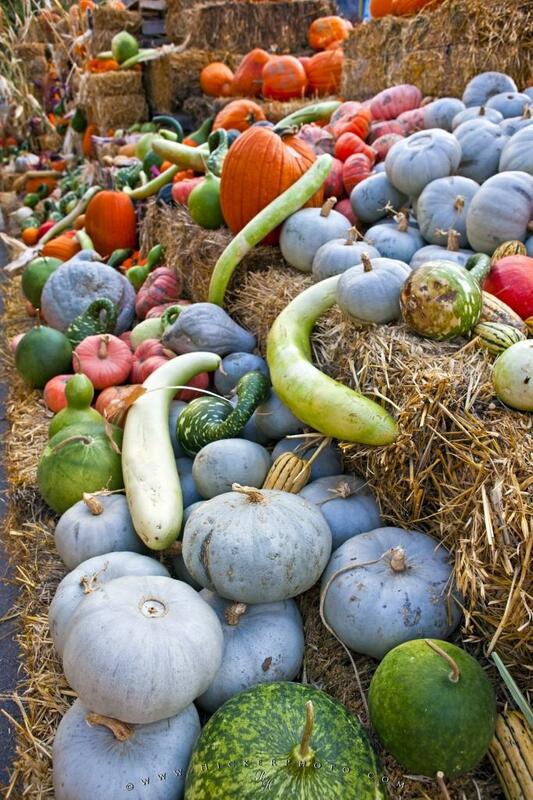 Multiple colours of orange, grey, and green in multiple shapes, a fall season display of pumpkins, squashes, and marrows adorn the property of a fruit and vegetable stall in the Okanagan. Every fall season a variety of pumpkins, squashes, marrows and other vegetables are put on display at the produce stalls in the town of Keremeos, Okanagan. These colourful displays of vegetables coincide with fall, and often include props such as vintage vehicles and farm machinery, horse buggys, or simply bales of hay. Pumpkins, squashes and marrows for sale at a produce stall in the town of Keremeos, Okanagan-Similkameen Region, Okanagan, British Columbia, Canada.